This course provides an introduction to laboratory animal anaesthesia, to the level required to meet the learning objectives in EU Module 20. During parts of this training you will be given the role of a new personal licence holder and will be taken through a training placement at a research facility. You will learn which methods of anaesthesia are suitable for use when performing brief, relatively non-invasive procedures, or uncomplicated terminal (non-recovery) techniques in laboratory animals. Anaesthetising animals for more invasive or complex procedures requires completion of additional, more advanced training and this is provided in EU Module 21. What does the Oxford English dictionary define anaesthesia as? The Oxford English dictionary defines anaesthesia as a “loss of sensation”. It can be produced either by blocking sensation to a particular region of the body (local or regional anaesthesia), or by administration of drugs that produce a loss of consciousness (general anaesthesia). Most laboratory animals are anaesthetised using general anaesthetics, but local anaesthesia can also be useful, for example local anaesthetic cream (e.g. EMLA, Astra) can be applied to intact skin to prevent pain or discomfort associated with venepuncture. Please select the correct answer below. For what reasons may you need to anaesthetise an animal? The depth of anaesthesia and the choice and dose of anaesthetic agent may vary depending upon which of these aims is to be achieved. Select the correct answers from the options below. Controlling unwanted variability is crucial to producing high quality research data. An increased variation in your data caused by use of an inappropriate anaesthetic technique, or by using a technique incorrectly may lead to an increased number of animals being required for the study. Increased mortality from poor anaesthetic technique will also increase the numbers of animals required for the study. Carefully planned anaesthesia and pain management can help you refine your study and reduce the number of animals you use. Refinement and reduction are two key principles of the 3Rs ethical framework. The 3Rs are a widely accepted ethical framework for conducting humane and high quality animal experiments. Replacement - Methods which avoid or replace the use of animals. Reduction - Methods which reduce the number of animals used. Refinement - Methods which reduce to a minimum the pain and distress experienced by those animals which it is still necessary to use (after first reducing and replacing animals in your research). Carefully planned anaesthesia is a crucial part of applying the principles of refinement and reduction to your research project. When drafting project licences you will be asked to explain how you will address the 3Rs in your work. You need to explain why you will not use anaesthesia and analgesia if pain and distress is expected. Select the 3Rs from the options below. Is anaesthesia safe for the animal? When we produce general anaesthesia, we depress activity in the brain and spinal cord, and this causes the animal to lose consciousness. At deeper levels of anaesthesia, the animal becomes insensible to painful stimuli. We need to remember that other body systems, such as the heart and lungs may also be affected. Often, blood pressure falls and respiratory functions are impaired. If anaesthesia is too deep, the depression of these different body systems can be life-threatening. To recognise when body systems are being depressed during anaesthesia, we can monitor the animal, and take measures to minimise these effects. For example we can give oxygen, or infuse fluids to support the circulation. During general anaesthesia, blood pressure is often increased, because of the stress caused by anaesthesia. Please select the statement which is correct. Which of these animals should have food and water withheld (fasted) before anaesthesia? Anaesthesia may produce nausea and vomiting so some animals should be fasted before surgery. Dogs, cats, non-human primates and ferrets vomit. Pigs sometimes vomit. Sheep and other ruminants regurgitate. There is no need to withhold food and water from rodents, rabbits and guinea pigs as these animals do not vomit. Can animals be anaesthetised as soon as they arrive in the animal unit? To be sure that animals are fit to be anaesthetised, they should be given time to become acclimatised to the animal unit (for 7-10 days). Reducing stress also makes anaesthesia safer for the animal. Before anaesthetising animals they should be examined and checked that they are in good health. Most laboratory animals should be in good health, but it is important to assess this systematically. Animals should also be weighed, ideally on several occasions so that you can assess that they are fit to be anaesthetised. Anaesthesia is stressful, and can cause an animal to reduce its food and water consumption when it recovers. Continuing to weigh them will help ensure that they are recovering well from the anaesthetic. How long should you wait before anaesthetising an animal? The technique where you anaesthetise a localised area by injecting anaesthetic (e.g. Lidocaine) into the tissues is called local anaesthesia. Larger areas can be anaesthetised by blocking specific nerve trunks or by administration epidurally or intrathecally (into the CSF) but these are advanced techniques requiring specialised training. Other than the use of topical anaesthesia for procedures such as venepuncture, these techniques are most frequently used in larger species such as sheep. This is sometimes known as the Triad of Anaesthesia. These components can be provided by administration of several different agents in combination, or use of a single anaesthetic agent that produces all of these effects. The anaesthetic agents used can be given either by injection, or by inhalation. Induction (onset) of anaesthesia is usually smooth and rapid. Multiple animals can be anaesthetised at the same time (provided you can monitor them effectively). Injectable anaesthetics do not require the use of specialist equipment, but it is important to be able to deliver oxygen as many of these agents cause respiratory depression. Once the anaesthetic has been administered the dose cannot be changed. There is individual variability in the response to a given dose of anaesthetic. Since the dose of anaesthetic needed by individual animals varies, the best way to give these agents is by intravenous injection. 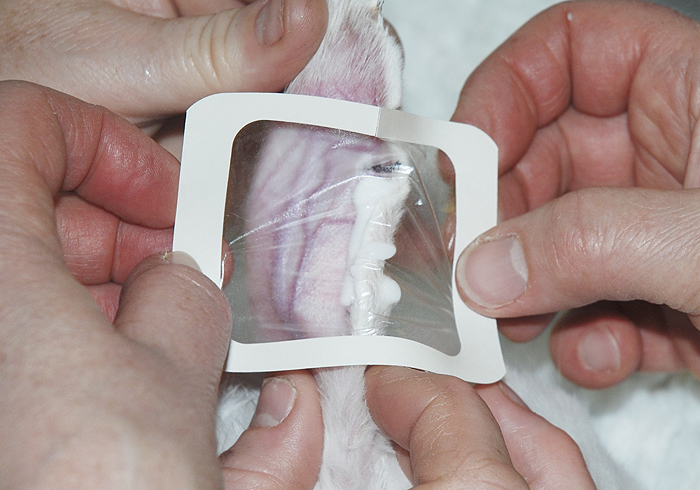 Intravenous injection is the preferred route for administering injectable anaesthetics as it allows the dose to be adjusted to match the particular animals requirements. Unfortunately it can be technically difficult to use this route in small rodents, so most injectable anaesthetics are given by intraperitoneal or subcutaneous injection in these species. The three components of general anaesthesia are sometimes called what? Please match the statements with their corresponding parts. multiple animals can be anaesthetised at the same time. induction of anaesthesia is usually smooth and rapid.